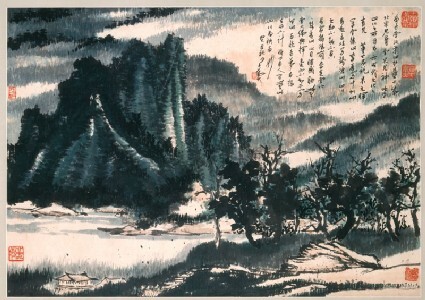 The long inscription refers to the great Northern Song (960-1127) calligraphers and the late Ming painting theorist Dong Qichang (1555-1636), and indicates that this is a landscape in Sichuan province. 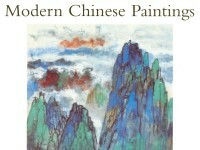 The darkness and contours of the hills are reminiscent of the paintings of Gong Xian (1619-89), while the short repeated vertical and horizontal brushstrokes reinforced the formulaic aspects of the painting. There is a long inscription on this painting, which reads: ‘Landscape painting was a great achievement of the Northern and Southern Song [dynasties, AD 960-1279]. Landscapes in the Northern Song show their ‘bone’, when those in the Southern Song show their spirit. These landscape paintings show the mountains and rivers as they naturally appear, but are also a representation of the culture of the time. Dong Qichang [1555-1636] said when Mi Fu [1051-1107] painted the mountains in Nanxu, Li Tang [1066-1150] painted the mountains in the central area, and Ma Yuan [c.1160-1225] and Xia Gui [active 1195-1224] painted the mountains in Qiantang, the inspiration they got from mountains and rivers cannot be compared [to each other].